The Mission of the Institute is to provide students with clinical training programs that prepare them to become qualified independent practitioners of Traditional Chinese Medicine (TCM)/Oriental Medicine. ATOM students will be trained to the highest standards of professionalism and ethics for the practice of acupuncture and Oriental medicine in the United States. To practice in a professional and ethical manner. To exercise appropriate clinical judgment with regard to patient assessment, diagnosis and decisions respecting therapeutic modalities, prognosis, and referral. prescription of Chinese herbal therapies. To become proficient in the theory and practice of nutrition and preventative care and to incorporate these principles and practices of Traditional Chinese Medicine/Oriental Medicine and to be prepared to counsel patients on elements of health. To promote the delivery of health care in the United States fully recognizing the complementary functions of Traditional Chinese Medicine/Oriental Medicine and Contemporary Western Medicine. To meet the requirements of the Florida Board of Acupuncture and the National Commission for Certification of Acupuncture and Oriental Medicine (NCCAOM) including the ability to pass the State and national acupuncture and herbal certification examinations. To demonstrate commitment to Traditional Oriental Medicine by participating in professional continuing education as a lifelong learning process. 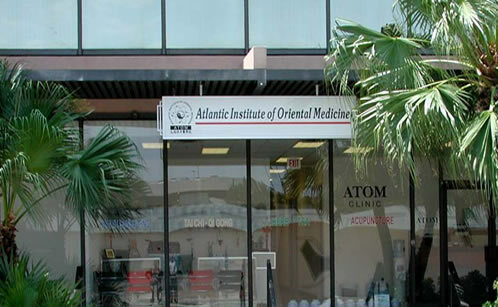 The purpose of the doctoral program in acupuncture and Oriental medicine (“DAOM”) at the Atlantic Institute of Oriental Medicine (ATOM) is to prepare practitioners in the care and management of patients with various medical conditions relevant to the Internal Medicine specialty focus of the program. Provide the resources (financial, human, physical) necessary to support the effective achievement of DAOM mission, goals and objectives. The Atlantic Institute of Oriental Medicine’s (ATOM) has developed the following educational objectives outlining the expected student learning outcomes for students attending the DAOM program. Integrate advanced Oriental medicine and biomedical concepts and clinical skills in the provision of patient-centered care, and apply this perspective in the prevention, diagnosis, treatment and management of a range of medical conditions. Demonstrate an appreciation for advanced concepts in clinical biomedicine and effectively communicate these concepts when collaborating with other healthcare providers in the care of patients. Effectively apply TCM Clinical specialty skills and knowledge in the care of patients. Identify, analyze and critically evaluate AOM-related research and professional literature and apply that information appropriately in clinical settings. Demonstrate both a commitment to life-long learning and the potential to make substantial scholarly contributions to the profession.